This is an interesting claim. My research (if you want to call finding a cool chart Wikipedia chart research) shows Iceland coming in 3rd to Japan and Hong Kong. FYI…the U.S. comes in tied for 36th place with Cuba and Denmark. 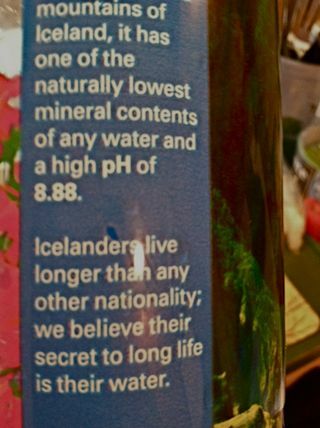 So the claim that Icelanders live the longest is in dispute, but what about the pH of their amazing spring water? Could it account for longevity? Should I be worried about my pH? The pH of the human body is variable depending on the part of the body you’re talking about. The stomach has a pH of about 1…very acidic. This is useful in breaking down the food into smaller, more digestible pieces. Lysosomes, the small bags of chemicals found inside cells are used to break down damaged cell parts. They can have a pH of 4-4.5. Our blood is at a relatively steady pH of 7.34-7.45. The body keeps the pH of our tissues relatively constant completely separate from our diet. Our mouths are a bit of an exception. The pH can range quite significantly in our mouths due to the presence of acid producing bacteria. Some of the bacteria in our mouths can turn the carbohydrates that we eat into acid. I’ve talked quite a bit about this in previous posts. This acid can dissolve the surface of the tooth if it reaches a critical pH. The critical pH, or the pH at which tooth structure begins to dissolve is 6.7 on the root surface of the tooth and 5.2 on the enamel. Diet, habits and saliva flow have a lot to do with how well an individual defends against pH drops in the mouth. But these localized oral pH fluctuations are not the same as pH change of the body. You often hear claims that the pH of your body being off or unbalanced are the cause of disease. Whether these claims are indirect like my water bottle or more direct as in some blogs or books, they need to be looked at critically. Most of these claims have no basis in science or actual physiology. Beware of diets or claims that talk about “changing your body pH.” Often they direct you to test your saliva to evaluate your body’s pH. That would be akin to checking the inside of your furnace to evaluate what the temperature of your house is! Your body has very specific control mechanisms for regulating your pH through the lungs and kidneys. Your diet makes no difference with regard to your body’s pH, except in your mouth! Some disease states can result in pH changes. Diabetics can experience diabetic ketoacidosis, which can lower the pH of the blood. This is a consequence of their inability to use sugar in their bodies. However, in healthy individuals this is not a concern. 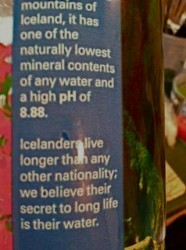 So, do I think my Iceland Pure Spring Water at a pH of 8.88 will prolong my life? Not really. However, it was cold and delicious and made it so I wasn’t so thirsty. So it did what I was hoping it would! Do you have comments or questions about this or any of my other posts? Do you like what you see on my blog? Leave a comment here on the blog or feel free to email me at alan@meadfamilydental.com. This Saginaw dentist writes all the posts and answers his own email. Thanks for taking the time to read!